Following is the dilapidated graveyard of 119 Pakistan passengers thousands of miles away from Pakistan, yet still unforgotten by many - can you guess where it could be? These unlucky 119 crew / passengers were aboard Pakistan International Airlines (PIA) flight PK 705, the inaugural flight to Cairo, Egypt. The flight had taken off from Karachi, had a brief stay at Dharan Airport , Saudi Arabia and then headed for Cairo on 20 May 1965. 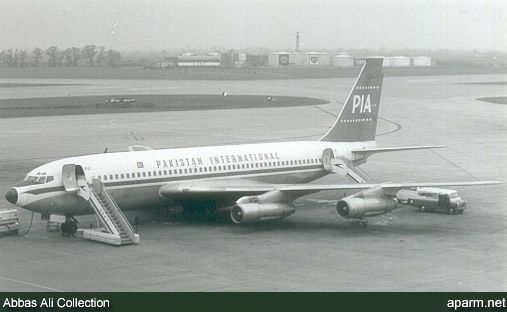 The aircraft was Boeing 720–040B serial AP-AMH, which had on board one of the best crew of PIA, flown by Captain Ali Akhtar Khan (captain of the flight) and Captain Afzal Johari (the co-pilot), and some of the best journalists of Pakistan and a number of important travel agents, going to Cairo to open a new vista between the relations of Egypt and Pakistan. The flight was as normal as any flight could be and contacted the Cairo Air Traffic Control (ATC) and was cleared for landing for a left-hand approach circuit for runway 34 at about 23:40 GMT. The crew of the aircraft reported final alignment to the ATC thereafter. But that was the last transmission made by the aircraft. When the aircraft did not land in the stipulated period of time, it worried the Cairo ATC who ringed the alarm bells. The ill fated inaugural flight PK-705 was found crashed short of the runway in the blowing sands of Egypt. Thee were only six survivors. This was the 4th loss of a Boeing 720, of which 154 were built at that time and was the worst accident of the time, and second till date. I was 10 years old then, and this was the first aircraft accident news of PIA that I heard and was really saddened as news papers of the time filled countless photos of those who perished in the crash. I remember how stories later came up that there were few passengers who got late and were left out and how they lamented to have been missed out at the airport - only to find out how luck they came out to be for having missed the ill fated aircraft.